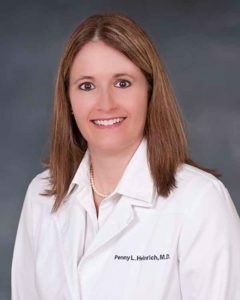 In September 2015, Dr. Penny Heinrich founded Suncoast Cancer Institute in Sarasota to provide personalized cancer services to her patients ensuring that each patient receives the best care and respect. Originally from the Toronto, Canada area, Dr. Heinrich grew up in Sarasota, graduating from Sarasota High School and received her B.A. degree from the University of South Florida in Tampa. After taking time off to start a family, she returned to school to receive her M.S. and medical degree from the American University of The Caribbean, School of Medicine in St Maarten, Netherland Antilles. Dr. Heinrich completed her residency in internal medicine at Louisiana State University in New Orleans, LA, and her fellowship in hematology and oncology at Louisiana State University in Shreveport, LA. Dr. Heinrich is board certified in internal medicine and medical oncology and provides comprehensive care for all types of cancer, as well as malignant and benign blood disorders. Having practiced in Thomasville, Georgia and New Port Richey, FL., Dr. Heinrich is excited to be practicing in her home town of Sarasota and is committed to serving her patients by offering quality health care and personal service. Dr. Heinrich is a Board Member of the American Cancer Society of Sarasota as well as a member of the Florida Society of Clinical Oncology, American Society of Clinical Oncology, American Society of Hematology, and the American Medical Association. Dr. Heinrich is married with three grown children and her hobbies include physical fitness, arts and crafts, and decorating.